Come join us for three days and two nights of good times and good food with some great guys. 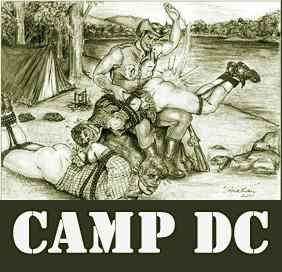 If you’ve ever wanted the chance to get some outdoor play in and not have to worry about your neighbors seeing you string up a guy naked from that tree in your backyard, then Camp DC is the place for you. You can run around naked all weekend and the only thing you have to worry about is the occasional bug bite, or in some cases, a pup bite. All the hot, steamy play you can pack into three days and two nights, and all the hot steamy showers you need to help clean up afterward. Please note that Camp DC is open only to members and sponsored guests of Discipline Corps. To help us maintain the security and exclusivity of this event, we ask that you include your Discipline Corps Sponsor's name in the appropriate field in the registration form. This information will be verified, and any registrations submitted without appropriate sponsorship will be cancelled and refunded. For more information on sponsorship, please contact the event organizer at: RunCaptain@DisciplineCorps.com.